The Rajasthan Institute of Engineering & Technology organized an expert talk and workshop on 19.9.18. Eminent guest speaker who graced the occasion was Mr Jitendra Tiwari, from Made Easy Pvt Ltd, New Delhi. This session was also graced by other dignitaries of repute, Mr Samar Nayyar, Centre head Made Easy Pvt Ltd, Jaipur, and Principal RIET, Dr Saroj Hiranwal. 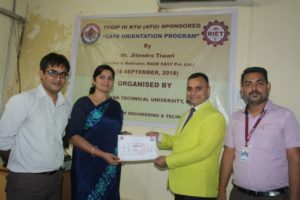 On the onset of the session Mr Jitendra Tiwari was welcomed by, Dr Saroj Hiranwal, Principal RIET, who spoke at length about the importance of the Engineering education mainly about the quality of education imparted to the students and various competitive examinations with more emphasis to GATE examination. Mr. Jitendra Tiwari, educationalist by profession, his name is registered in LIMCA BOOK OF RECORDS for memorizing world’s toughest dictionary GRE Barrons, words with meanings; words with page numbers & words in a sequence A to Z and Z to A. He completed his schooling from Army School. During his Graduation he completed NCC ‘C’ certificate, Represented M.P. at national level in Football. He did the mountaineering course at HMI, Darjeeling, where he was selected Best Trainee of the Course & awarded GOLD MEDAL. He has been nurturing students nationwide for the past 18 years. In this Span, he has conducted many Seminars in prestigious schools & Colleges. 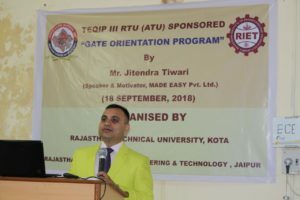 The seminars which have been conducted Nationwide by Mr. Jitendra Tiwari, to name a few they are at IIT Delhi, NIT Delhi, DTU Delhi, and various other prestigious organizations in the country. The main topic of discussion was on – “How to memorize faster and retain it for longer duration” and “Career aspects after B.Tech.” “Career opportunities in Engineering services, GATE and Public sector”. Mr. Jitendra Tiwari said that with the effective use of memory enhancement techniques one can rapidly memorize and recall information. This saves valuable study time, develop higher self confidence, improve concentration, observation and overcome absent mindedness. Practicing memory techniques also prevent students from ‘blanking out’ during exams. He said that strong memory is a very important element to achieve success in examinations, campus interviews and in everyday relationship. 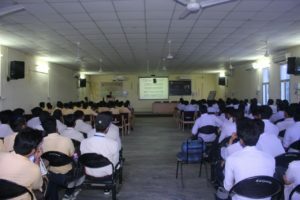 During the workshop Mr. Jitendra Tiwari demonstrated memory techniques and gave away memory enhancement tips to the students. The session was attended by HODs, faculty members and the students of second year, third year and final year. The session proved to be highly beneficial to all who were present in the gathering.